In Jack London's "To Build A Fire," the main character ultimately perishes for want of being able to start a flame in some seriously sub-zero temperatures. I'm gaining new-found respect for the Eskimos, because Jack London's character wouldn't have fared any better if he had tried to build an igloo. This is hard. 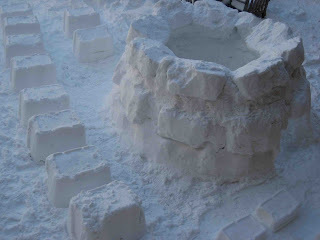 Inspired by this guy, my wife and I decided to try our hand(s) at constructing an igloo. He really makes it look easy ... nice, neat, regular snow blocks that stack neatly and uniformly to make a dome. 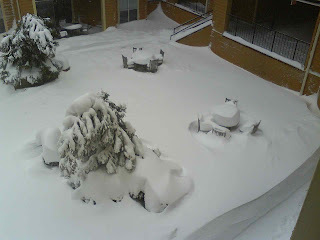 Our courtyard area has tons and tons of snow after the SnowFecta, so we picked a place that looked like it wanted an igloo. We don't own a snow shovel, which is a bit of a handicap when trying to fill large buckets. Of course, everyone and their grandmother rushed out to buy snow shovels last week, so it's unlikely that we'd be able to buy one now. Nevertheless, we got a good two hours of clearing, block-making, and stacking in last night before the light went away. I was a little disappointed in how things turned out. In the videos and instructions you see, they make it seem like the snow is made out of modeling clay: easy to shape, grip, and slice around however you like. Maybe conditions aren't perfect for us, but it isn't packing very well. The large blocks tend to lose corners or crack through awfully easily, the small blocks crumble in your hands. When packing a large block, pack it dense when it's halfway full. Then pack it again when it's full. If you don't do this, the bottom of the block stays fluffy and doesn't make a good brick. Clear the area of as much snow as you can before letting the bricks settle for an hour or two. This makes it much easier to cut the brick out when you're ready for it. After they've settled, RE-FLIP the blocks when stacking them on the igloo. I guess this doesn't apply if you're shaping them into perfect squares, but our snow just isn't good enough for that. Since the storage box is tapered slightly towards the bottom (wide end on top), it's much better to stack the snow blocks with the narrow end on the bottom. It gives you a much better surface for the next layer. Then stuff snow in the remaining cracks and holes. A large kitchen knife is very handy for cutting the blocks free and beveling the edges so things slant in properly. Plastic dustbins get brittle in the snow and break. They don't make very good makeshift shovels. Pet dogs tend to be more disruptive and destructive than you'd like. They also take pride in making yellow snow. So far we've got about three layers of large blocks, which is good for 4.5 to 5 feet in height. It's quite an impressive amount of snow when you look at it, but closing up the top hole is going to be tough. In the picture, you can see our line of large blocks "cooking" on the left. There are also two small blocks "cooking" on the bottom right ... those are the ones that haven't settled very well. They seem like they'll be great pieces for the top, but we hope they won't crumble. You can also see our construction method: two layers of big blocks (before I figured out that it's a good idea to re-flip them when stacking), followed by a layer of small blocks (mostly crumbs, really), and a 3rd layer of big blocks. We did the two layers + crumbs last night, and then the 3rd layer this morning. We're letting the blocks "cook" during the day while we do other things like work. You can also see the entry hole on the right of the igloo. An entry hole takes up a frightening amount of real estate! Make sure you have a good 3 feet of snow (at least!) on the igloo before you start cutting it out. Also stay as low as possible ... think of trying to dig underneath the igloo to keep as much snow as possible in the walls. We'll try the next few layers later this evening, and will update the results.